The Central Branch Library in Bristol was built in 1906 as a result of a bequest by Vincent Stuckey Lean of £50,000. But long before that time, Bristol's library was famed all over Britain. Bristol boasted one of the earliest libraries in Britain, with the first official library as early as 1464. Down through the centuries, the original library moved several times, and eventually fell into disarray and poor repair near the end of the 19th century. During most of its existence, the sum of £4 was levied on all who desired to use the facility, which limited the patrons. But with the emergence of more and more literate Britons during the Victorian era, the small library in Bristol became woefully inadequate for the populace living in Bristol and nearby hamlets. During the last few years of the century the Bristol Corporation queried many for funds to build a new repository to the city's volumes. At last a wealthy bachelor, Vincent Stuckey Lean provided the funds for a new library which was completed in 1906. Lean was a patron of the arts and had inherited a large sum of money from his family banking business. Since 1906, the Bristol Library has lived up to its illustrious past. 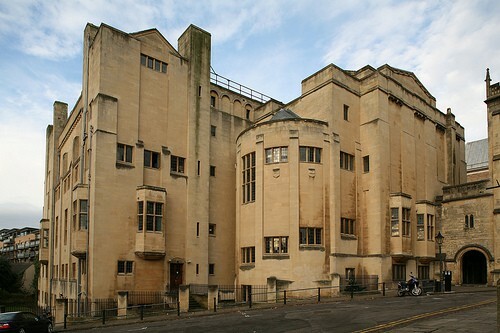 Situated just off College Green in Bristol, the library is a supreme example of early 20th century architecture. Earlier this decade it was awarded the prize as one of Bristol's finest buildings. Housing modern day technology and equipment, library patrons will find a well stocked facility including a children's section, video and audio selections and a music and drama section. Genealogists will also find a family history department for help locating antique family records. The Bristol Library is open daily, and features a small cafe on premises for a lite lunch or afternoon tea. ©2019 - bristolarchitects.com All Rights Reserved.